You are welcome to contact us for additional information, however, only those families/individuals on our waiting list are guaranteed a puppy from an upcoming litter. 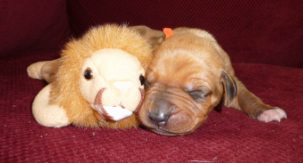 Families are added to our waiting list only after they have been interviewed (either in-person at our home or via phone), have read, understand and agree to the terms of our puppy contract and are serious about and committed to all aspects of adding a Rhodesian Ridgeback to their family. Those added to our waiting list are specifically interested in a puppy from our family, not a first-available/quick purchase puppy. Those on our waiting list also understand that should we not have a large enough litter or an appropriate/compatible puppy to place with them, they may need to wait until our next litter; this often times can mean a 1-2 year wait for the right puppy. Families on our waiting list also understand that once a litter arrives, they must visit our home to meet and interact with the litter at least once (this is typically done between 8 and 11 weeks of age) to ensure a compatible puppy suitable for placement with them is available. No, we do not accept deposits. We do not want a family to feel financially obligated to take a puppy in the event a major life change has occurred between placing a deposit and the puppy's departure from our home. We also do not allow puppies to leave early. Our puppies are only released to their new homes at a developmentally appropriate age (12-13 weeks old). Please refer to the Puppy Culture Program for more information. Once a litter has whelped, we select a departure date for our puppies and organize a Puppy Party. Our Puppy Party allows all the families to meet each other and ask questions of us as a group; it also allows the pups to leave in a mass departure which reduces stress on their dam and other dogs in our home who have helped rear them, their littermates, as well as us. Meeting the other families also allows puppy families who reside relatively close to each other to potentially raise their puppies together (attend the same puppy classes or play groups, organize outings to the dog park together, or even pet sit for one another). All adopting families must be able to attend our Puppy Party to pick up their new puppy. Lastly, we do not allow families to "pick" their puppy. 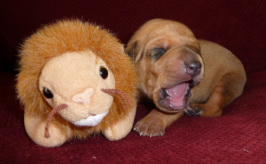 We place our puppies based on personality, temperament and compatibility with a particular family. Although we take gender preferences into account when possible, choosing a puppy based on photos, physical attributes (ridge, nose colour, etc.) or a particular collar colour does not often render an ideal fit. Be mindful this new addition to your family will likely be your constant companion for the next decade or longer; trust that we have come to best know our puppies best and can determine which puppy will be a good fit with your family. All families on our waiting list must have visited the litter (between 8 and 11 weeks) before we are able to determine the ideal placement for each puppy in the litter.